Home › Forums › Water Heater Discussion › Power Vent water heater venting ???? This topic contains 8 replies, has 8 voices, and was last updated by Mahes 2 years, 11 months ago. I live in Ontario, I rent a water heater ( 14 years old) from direct energy, and have a service plan with them for my furnace and HWT, I had no hot water so called them up, guy came out found that the venting had cracked apart, and another part was also changed, guy said venting needs to be repaired and changed from ABS to 636 pipe, for a total of $370, I heard that unless the vent motor was changed to newer one, with 636 already on it , I would not have to change the entire venting to 636, any input one this would be great, please and thanx in advance ! We bought a house few weeks ago and our hot water heater is very old-15 years and we wanted a bigger unit. We called Direct Energy who sent tech to come out. He said that they will replace the tank free of charge but we have to replace the venting for safety purposes as well, which is understandable but the charge would be $325 for the venting. He shut off my water and told us he won’t come back unless we do it. I am really frustrated now, we have no hot water, this is a rental unit and why should i be paying for something that is rental? What are my options? Do i have to pay for this? PokerMan52 wrote:We bought a house few weeks ago and our hot water heater is very old-15 years and we wanted a bigger unit. We called Direct Energy who sent tech to come out. He said that they will replace the tank free of charge but we have to replace the venting for safety purposes as well, which is understandable but the charge would be $325 for the venting. He shut off my water and told us he won’t come back unless we do it. I am really frustrated now, we have no hot water, this is a rental unit and why should i be paying for something that is rental? What are my options? Do i have to pay for this? Stay away form Direct Energy they tried to run their scam on me too. When the guy turned off my water, i turned it back on i am not stupid. That was the last i dealt with them, i called a contractor who replaced my unit and venting for no charge and simply put me on the rental with another company. My black venting fell apart and when i would not have realized it if i didnt start smelling gas in the furnace room. We called Enbridge who came and shut off the gas and told me to call Direct Energy and have them fix it. When Direct Energy came they quoted me $310 for replacing the piping which sounded rediculous. I went online and found Direct Home Ontario who said they can do it free of charge but my old tank will need to be upgraded to an energy efficinet one too, i told them just to go with it. Tech came the next day did a great job and gave me also 2 months free off my rental. So if you having this problem call them. YorkyH1987 wrote:My black venting fell apart and when i would not have realized it if i didnt start smelling gas in the furnace room. We called Enbridge who came and shut off the gas and told me to call Direct Energy and have them fix it. When Direct Energy came they quoted me $310 for replacing the piping which sounded rediculous. I went online and found Direct Home Ontario who said they can do it free of charge but my old tank will need to be upgraded to an energy efficinet one too, i told them just to go with it. Tech came the next day did a great job and gave me also 2 months free off my rental. So if you having this problem call them. i learned that you can have different company do an upgrade of your hot water heater and venting free of charge in Toronto if you get a rental with them instead of Direct Energy and it turns out if your existing hot water heater belongs to Direct Energy and was installed before September 2010 you can have it replaced with any other supplier free of charge and there are no penalties for doing so. 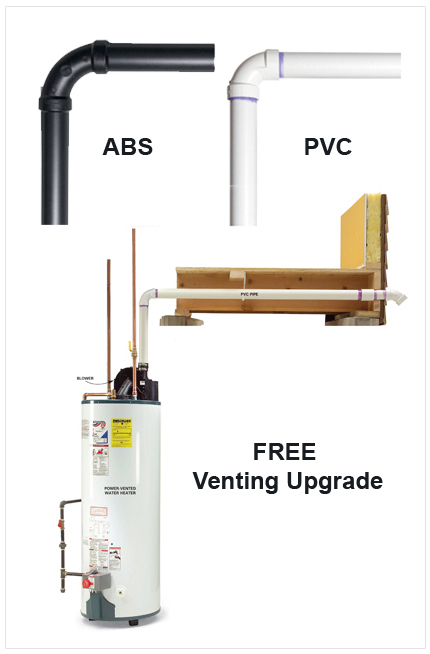 Most companies are upgrading ABS venting to PVC free of charge when you replace your power vent water heater. SOme companies can charge you extra if your venting is very long or you have 3″ venting but you can bargain with them and find someone who will do it free for you, that’s what I did.